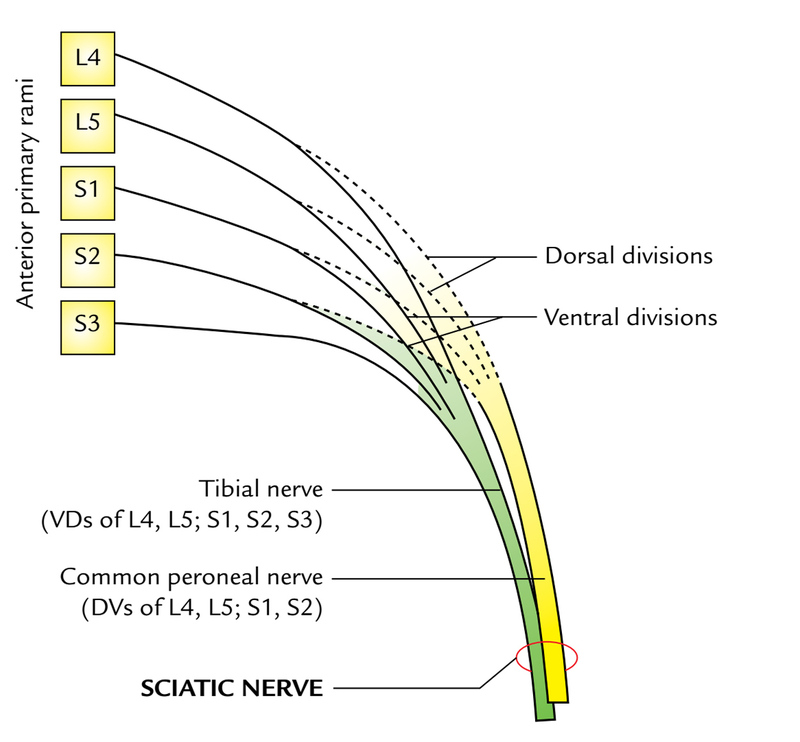 Sciatic Nerve is the thickest nerve in the body. At the beginning it is 1.5 to 2 cm wide. It is composed of 2 parts tibial and common peroneal nerves and its point of origin is in pelvis of ventral rami of L4 to S3 spinal nerves. Ventral sections of anterior primary rami of L4, L5; S1, S2, S3 compose the tibial part. Dorsal sections of anterior primary rami of L4, L5; S1, S2 compose the common peroneal part. The 2 parts are typically enclosed in a standard sheath of the connective tissue. It goes into the gluteal region while, leaving the pelvis via greater sciatic foramen below piriformis. Here along the back of the thigh, it descends between the greater trochanter and ischial tuberosity. A little above the popliteal fossa (junction of middle and lower thirds of the thigh), it breaks up into terminal tibial and common peroneal nerves. It commences in the pelvis and ends at or just above the superior angle of the popliteal fossa by breaking up into tibial and common peroneal nerve. In the pelvis, it is located in front of piriformis under cover of its fascia. It enters the gluteal region via greater sciatic foramen below the piriformis. Here it runs downward with small lateral convexity and enters between the ischial tuberosity and greater trochanter. It enters the back of thigh at the lower border of the gluteus maximus and runs vertically downward. Just above or at the superior angle of the popliteal fossa (roughly at the junction of upper two-third and lower one-third of the back of thigh) it splits into 2 endmost branches- tibial and common peroneal nerves. The common peroneal nerve goes through the piriformis and tibial nerve enters below the piriformis (12%). The common peroneal nerve enters above the piriformis and tibial nerve enters below the piriformis (0.5%). The first point is marked 2.5 cm lateral to the midpoint of the line joining the anterior superior iliac spine and ischial tuberosity. 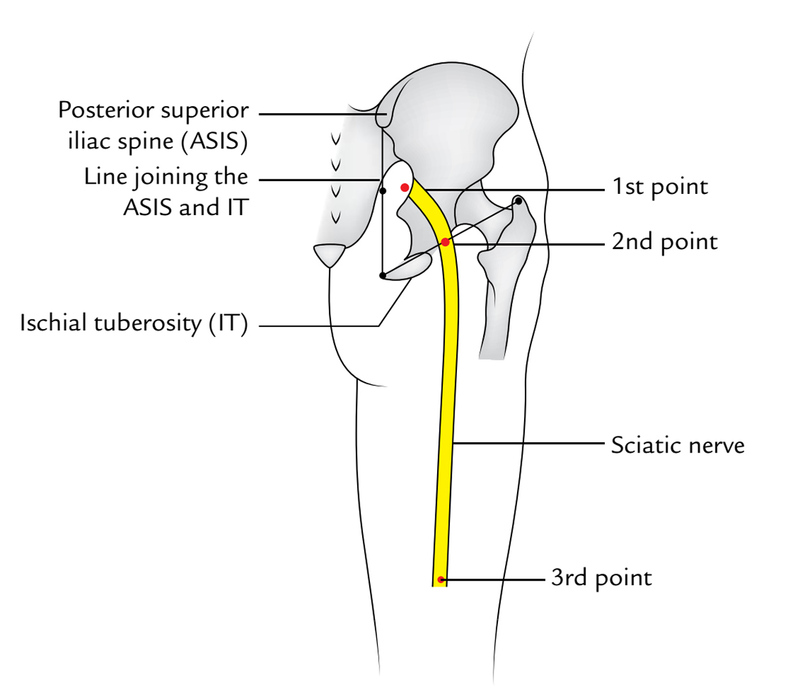 2nd point is marked halfway between the ischial tuberosity and greater trochanter. The third point is indicated in the junction of the upper 2/3rd and lower 1/3rd of the back of the thigh. A thick curved line (about 2 cm wide) with outward convexity joining the first and 2nd points represents the sciatic nerve in the gluteal region and a thick straight line of exactly the same width joining the 2nd and third points represents the sciatic nerve in the thigh. Body of ischium (posterior surface). Tendon of obturator internus and related gemellus superior and gemellus inferior muscles. Gluteus maximus (in the gluteal region). Long head of biceps femoris (in the thigh). The sciatic nerve is reachable on the back of the thigh, only in the angle between the gluteus maximus and long head of biceps femoris. Articular branches to the hip joint originate in the gluteal region. Muscular branches to the hamstring muscles originate in the lower part of the gluteal region or in the upper part of the thigh from the medial side of the nerve. Muscular branch to the short head of biceps femoris originates in the lower part of the thigh from the lateral side of the nerve. 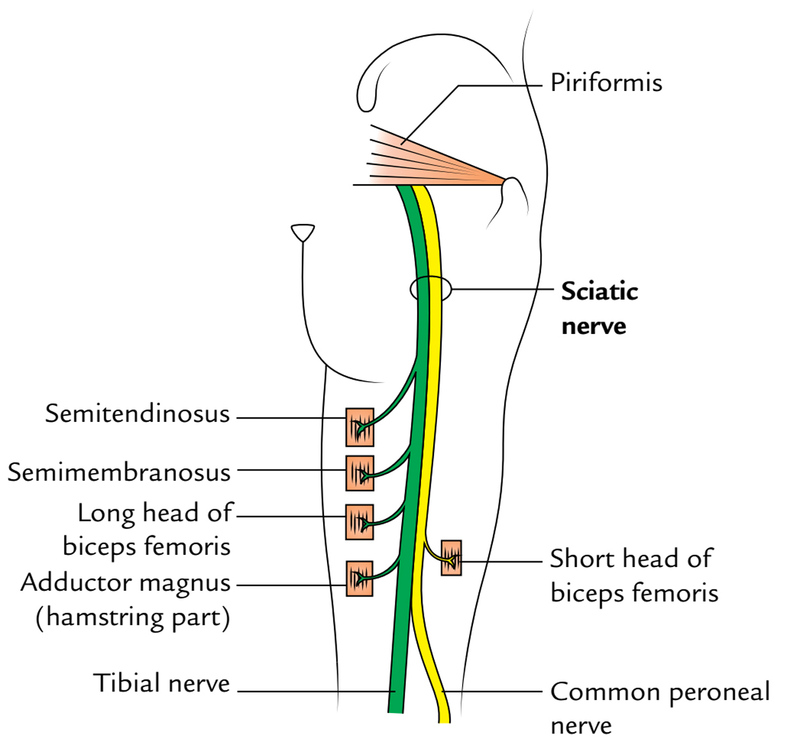 All the muscular branches of the sciatic nerve originate from the medial side with the exception of nerve to short head of biceps femoris, which originates from the lateral side. Thus, the side lateral to the sciatic nerve is safe side and the side medial to its dangerous side/unsafe side. The motor branches from undivided trunk supply all the muscles of the back of thigh, which stretch the hip and bend the knee. The motor branches of the tibial Nerve supply the muscles of the leg, which bend the leg and muscles of the foot, which plantar flex the foot. 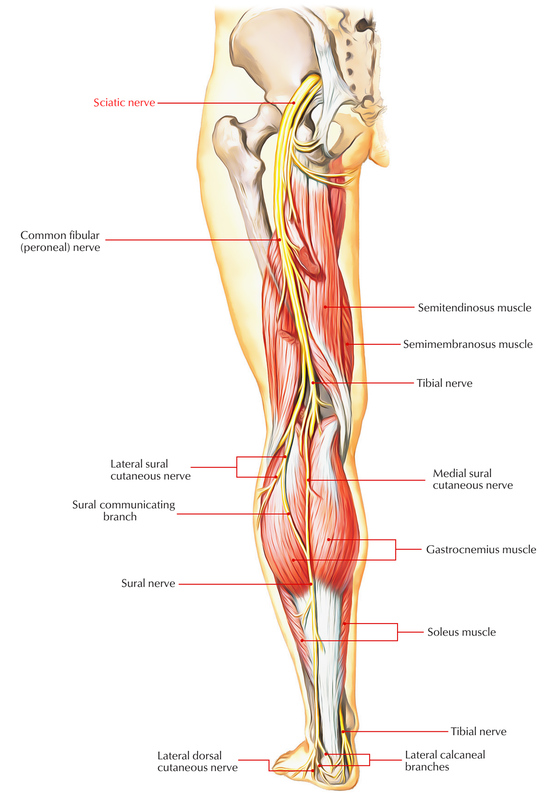 The motor branches of the common peroneal nerve supply muscles of the leg which dorsiflex the foot. The sensory branches of the tibial nerves supply the skin on the rear of the calf, medial and lateral sides of the heel, lateral border of the foot, and entire of the sole. The sensory branches of the common peroneal nerve supply the skin on the anterolateral and lateral surfaces of the leg and whole of dorsum of the foot with the exception of the area that is supplied by the deep peroneal nerve. Inability to stretch the thigh and bend the knee, as a result of paralysis of the hamstring muscles. Loss of all movements below the knee with foot drop, because of paralysis of all the muscles of the leg and foot. The motor loss results in flail foot that results in great trouble in walking. The patient walks with high-stepping gait. The sensory loss on the back of the thigh and entire of the leg and foot with the exception of the area innervated by the saphenous nerve, because of participation of the cutaneous nerves originated from the tibial and common peroneal nerves. As the sciatic nerve makes the pelvis, occasionally, it goes through the piriformis muscle and at that stage, it might become entrapped leading to piriformis syndrome. It’s a common anatomical form but an incredibly uncommon entrapment neuropathy. It’s a term applied to a clinical condition defined by shooting pain felt along the course of distribution of the sciatic nerve (example, buttock, posterior aspect of the thigh, lateral aspect of the leg, and dorsum of the foot). It happens because of compression and aggravation of L4 S3 spinal nerve roots by herniated intervertebral disc of the lumbar vertebrae. The sciatic nerve is uncovered on the back of thigh in the angle between the lower border of gluteus maximus and long head of biceps femoris. The temporary compression of the sciatic nerve against femur at the lower border of gluteus maximus causes paresthesia in the lower limb. It’s named “sleeping foot, example, when a man sits on the hard edge of the seat for a long time”.